Barbara grew up in Toronto and at the age of 5 her painting skills were first recognized. In 1971 Barbara went to Europe, for 5 years. Finally settling in London in the fall on 1974 she became a member of The Arts Club Mayfair. and Chelsea Arts Club. Returning to Toronto in 1976 she worked with Columbia Pictures Television until 1981 when they stopped producing TV programs in Canada. She then started painting at her first art studio in downtown Toronto, her work at that time was very naive and was inspired by the English artist Beryl Cook, around that time she got accepted by the Ontario College of Art and Design she studied under famous Canadian artists such as Graham Coughtry and Ian Carr-Harris, she graduated in 1988 in Experimental Arts at OCAD. In 1992 Barbara went to Russia where saw the shows of the Impressionist artist Matisse at the Hermitage and Fernando Botero at the Pushkin, Moscow. During the same trip Barbara saw the Barnes Collection at Musee D'Orsay, Paris and was inspired by such master pieces. She produced a series of paintings based on the Impressionist, with her own interpretation of The Barnes Collection, which was later shown at Musee Hotel Baudy in Giverny. Throughout the 90's McGivern was represented by galleries in Yorkville, Toronto, Montreal, Edmonton as well as Zurich, Berlin, London, Paris and Madrid. 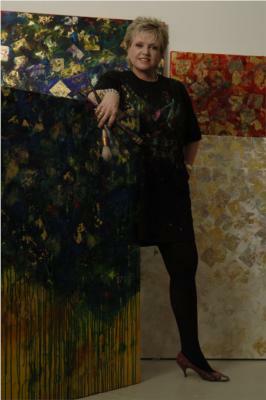 Barbara McGivern (born August 15, 1955), also known as The Gold Lady, is a Canadian artist born in Toronto, Ontario. One of her best known series is The Extraordinary Journey. The series was inspired by her trips through deserts of Oman and Saudi Arabia, when she began incorporating the use of gold leaf (18 to 24 carat) into her work. Her style is most notable for presenting gold as a colour rather than as a precious metal. Her paintings are in private and corporate collections in Canada, Europe and the Middle East. Barbara grew up in Toronto and where she currently lives. In 1971 Barbara went to Europe, for 5 years. Finally settling in London in the fall of 1974 she became a member of The Arts Club Mayfair and Chelsea Arts Club. Returning to Toronto in 1976 she worked with Columbia Pictures Television until 1981 when they stopped producing TV programs in Canada. She then started painting at her first art studio in downtown Toronto. Her work at that time was very naive and was inspired by the English artist Beryl Cook. Around that time she got accepted by the Ontario College of Art and Design she studied under famous Canadian artists such as Graham Coughtry and Ian Carr-Harris. She graduated in 1988 in Experimental Arts at OCAD. In 1992 Barbara went to Russia where she saw the shows of the Impressionist artist Matisse at the Hermitage and Fernando Botero at the Pushkin, Moscow. During the same trip Barbara saw the Barnes Collection at Musee D'Orsay, Paris and was inspired by such master pieces. She produced a series of paintings based on the Impressionist, with her own interpretation of The Barnes Collection, which was later shown at Musee Hotel Baudy in Giverny. Throughout the 90's McGivern was represented by galleries in Yorkville, Toronto, Montreal, Edmonton as well as Zurich, Berlin, London, Paris and Madrid. In 1996 McGivern went on an off-road driving trip across the Middle East, following the British adventurer Wilfred Thesiger's path through the deserts of Oman and Saudi Arabia and clocking a gruelling 3,000 miles in 8 days. While driving through the deserts she was amazed with the colours she saw and the richness of the sands which opened up a new concept to her work, where her acrylic paintings now recounted the deserts from a Canadian prospective, using gold as a colour as opposed to a precious metal. "My paintings are inspired by my trips, especially to the deserts of Oman and the UAE. I found the dunes to be a magical place with colours that I never thought could be possible in such a vastness of sand" stated McGivern in 1998 . She was represented by the Majlis Gallery, Dubai and was commissioned to do 22 paintings for the Jumeirah Emirates Towers Hotel. Throughout the years Barbara's work was sold to major collectors such as Sheikh Mohammed bin Rashid Al Maktoum and the Al Qasimi, UAE as well as different corporate collectors. When asked to do two horses for the Dubai's Celebration of Arabian Horses, her horse "Victory" was commissioned by Frayland and Penquin, Engineering and was the 3rd largest winner in the auction held by Christie's for 210,000 AED. The second horse "Red Fantasy" was similarly commissioned by Delwood Consultancy. McGivern represented Canada at the Women & Art, 2005, A Global Perspective, Sharjah UAE.